Beekeepers are really just supporters of a small society of insects with a prodigious level of productivity – the colony. We inspect our hives and enjoy its growth for months and, all being well, have the opportunity one day to enjoy honey. But it’s short-sighted to think of the beehive merely as a place from which honey is drawn. Beyond the wonder and joy we derive from the beautiful construction and use of honeycomb, it’s illuminating to considering the beehive as an industrial center, with incoming goods, a production line and the delivery of much more than mere honey. Weather permitting, large numbers of older worker bees will leave the hive to collect important resources. One of the joys of beekeeping is sitting back on a summer day and watching the furious activity of bees leaving and returning to the hive. There is a great deal to be learned from watching this activity. But first, let’s reflect on why this is all happening and looks at the reasons bees venture out from the hive. Perhaps the most obvious reason for bees to leave the hive is to collect nectar. Nectar is the raw material for honey, pending “processing” back at the hive. When nectar is processed, converted into honey and stored, it becomes a vital resource to the colony, not just for day-to-day purposes but particularly to help survive the winter months. Honey provides essential nutritional benefits to the colony. It is a rich source of carbohydrates, providing fuel for all aspects of a bees lifetime. Bees need energy for everything they do, particularly for flying and foraging. The need to flap their wings thousands of time per minute creates a huge energy deficit and the only way to keep up is to have “on-board energy” at all times. Honey provides this, with nectar as the starting point in its production. Pollen is perhaps the most visible of the commodities bees bring back to the hive. As a beekeeper, the sight of many workers returning with heavy and resplendent pollen baskets is beautiful and reassuring. While the layman considers pollination the primary reason why bees have pollen stuck to their bodies, that process is an incidental and accidental by-product of their flight between flowers, albeit one with enormous implications. But bees don’t collect pollen because they like the idea of helping with the reproduction of flowers! Rather, they need pollen back-at-base. What does pollen do for the colony? Pollen provides a wide range of nutritional components and is the principal source of protein for bees. The amount of protein is dependent on the flowers visited from which pollen is collected. This can be highly variable, with the protein component ranging from less than 10% to around 30% of the dry weight of the pollen. Pollen also provides important minerals such as calcium, potassium, sodium and others. Protein includes key amino acids and 10 of these are considered essential to honey bees, including threonine, valine, methionine, isoleucine, leucine, phenylalanine, histidine, lysine, arginine, and tryptophan. The quantity of amino acids present in pollen is also highly dependent on the floral source of the pollen. To some extent, propolis is a hidden resource. but still essential to bees. The layman has less of an awareness of propolis, as compared to nectar and pollen, but it is an essential component of the hive. To be strictly accurate, bees don’t collect propolis, they create it. They visit trees and other sources that release sap, bringing the exudate back to the hive. Then they mix in saliva and beeswax to produce an extremely sticky resin, which eventually hardens. The result is typically an unmistakable red, easily visible throughout the hive. Propolis, when “set”, is extremely strong and an important foundational element of any hive. Why do bees do this? For many years it was believed that propolis was used to reduce wind flow and chill, through the hive. Ventilation is a key part of any hive and bees will actively plan to ensure an appropriate flow of air through the hive. Perhaps the most gruesome use of propolis to mummify animals or insects. In some situations it may be problematic to remove dead animals or pests from the hive, when discovered. So rather than attempt that, bees sometimes encompass the offending object in propolis. Mummified mouse is “a thing” in the occasional beehive! Bees create and lay propolis to help with the structural integrity and strength of the hive. It is also used to seal entrances, where necessary. Oh – and mummify intruders! All living things need water and bees are no different. But, commensurate with the structured and planned collection of honey and nectar, bees approach the collection and use of water in a very meticulous way. Similar to how nectar is handled, bees at the hive form a welcoming committee for the water-collecting bees returning to the hive. The assessment of water needs for the hive is a highly dynamic process and the number of bees waiting to receive water sends a message to foraging bees. If there are many bees waiting then the returning bees will fly back to a water source to collect still more. The speed with which the receiving bees collect the incoming water is also a part of the messaging – fast, urgent collection equals “we need more, now!”. Thus, the number of bees waiting for water and their urgency regulates the overflow flow of water into the hive. Water is used in many ways throughout the hive. For cooling: Bees have quite the challenge to keep the inside of the hive cool in the heat of summer. They use a number of techniques, including an organized fanning of their wings to increase air flow, but water is an essential tool. They place a thin layer of water on top of capped brood (unborn bees in their cells, capped off with a layer of wax), which has the benefit of lowering temperatures when bees fan the water, creating evaporation. For nurse bees: Worker bees acting as nurse bees create large volumes of food for larvae and need water to help with that process. For re-hydrating honey: When honey is stored it has a tendency to crystallize. When bees need to consume the honey, they apply water to dilute the crystals. In general, bees collect water from the local environment on-demand, rather than collecting it and storing it in volume. There is beauty in all that bees do. The collection of water is no exception. A bee away from the hive is a bee taking a risk. There are many dangers that can potentially limit their ability to achieve their goal and return to the hive. These range from bee-eating birds to strong winds, rain and many other threats. With this backdrop, bees need to be efficient and focused in their travels. A single bee will leave the hive and take a seemingly random, irregular path to a flower. She will load up with pollen and return to the hive. In short, two things are needed for this scenario to play out – communication and navigation. Bees leave the hive to collect pollen from the same species of flower. But these bees don’t take the long way. They literally make a bee line (it’s named that way for a reason – it’s straight and direct). The returning forager bee has a story to tell. This includes direction and distance of the resource but, remarkably, even its value. That rich information is relayed in the waggle dance, a very efficient way for one bee to inform other worker bees of the riches she has found. But having some way to communicate is just one part of the story. The storytelling bee had to find her way back to the hive and, when she dances her story, the listening bees still need to travel to the prize. For those needs, bees need GPS-like capabilities. Let’s say a bee has collected its pollen reward and is headed back to the hive. Then, in our imaginary scenario, you kidnap that bee, transport her to a mystery location and set her free. At that point, she’s lost and will fly off in a random direction. But then something amazing happens. After a while she will realize she’s off track, she will re-calibrate and turn back towards the hive and find her way back. Bees possess some of the most sophisticated of navigational capabilities in the animal kingdom. To some extent the jury is still out on exactly how they do this. However, it is commonly accepted that it is a combination of factors, with reference to the sun being one of the more important. But even that is not the full story. If the path of the sun is a key component then it should be possible to confuse a bee by adjusting its body clock, using the same type of artificial confusion we face with jet lag. A recent study researched just that, by intentionally messing with bee’s access to light to see if it will confuse their body clock. Sure enough the initial signs supported the theory that the sun is the leading indicator, because these “jet-lagged” bees got it all wrong. 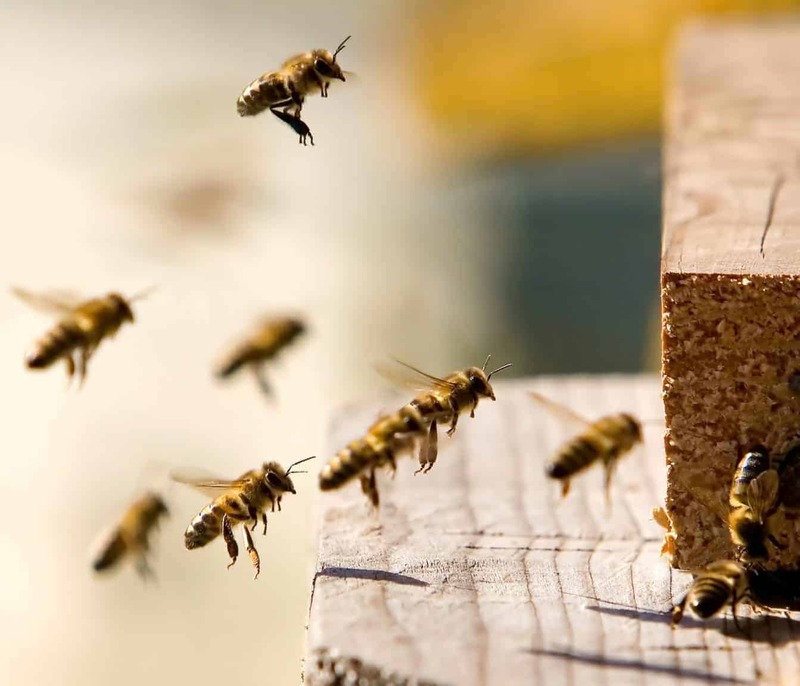 Then they quickly regained their ability to navigate back to the hive, regardless of their internal clock, subsequently finding their way back to the hive. The implication is that there are some cognitive abilities at play here, though it is still an aspect of bee’s life that is under scrutiny. Because, quite frankly, their navigational skills are amazing!